We take the cargo that customers put into our care, package it up so that it can be loaded onto aircraft, and send it all over the country. 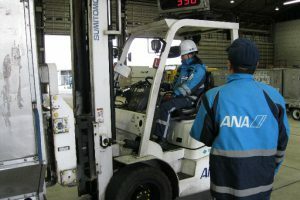 In the areas around aircraft parking spaces (spots), we take down and load luggage, freight, postal containers, and other items from the holds of ANA Group planes. Based on the personnel placement of the flights we are in charge of, we check in advance the flight numbers, models, times, spots, and return flight numbers, preparing vehicles and equipment ahead of time. 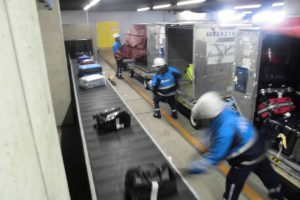 After the aircraft land, we swiftly take out the luggage and, after moving the arrived containers, etc. 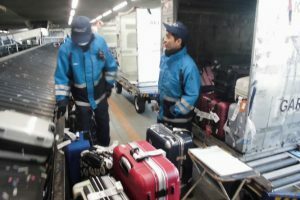 onto the various equipment, we quickly begin loading the departure freight and luggage into the hold for the return flight. 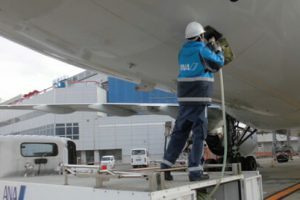 Flights get delayed if our work is faulty, and passengers’ valuable time is stolen away. 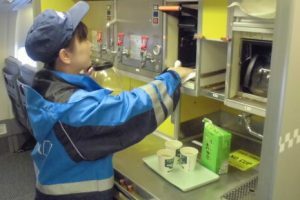 That is why all staff in the sections we handle maintain the awareness “not to waste even one second,” and do their work together as a team. Checking the bag tags on each and every piece of baggage, we sort them by destination and flight number. 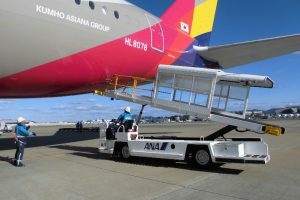 We quickly set the equipment for use (ULDs/CTs/carts), balancedly stow baggage in containers, etc. 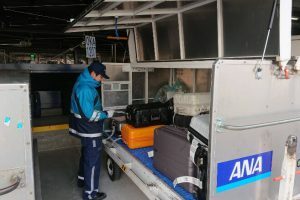 and, upon comparing the number we have been entrusted with, give directions for loading to the persons in charge of delivery for each flight. We handle baggage carefully and kindly. 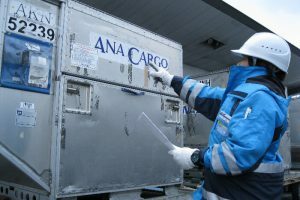 A variety of freight from various agencies - everything from postal items to freight such as precision instruments, fresh food products, and flora and fauna - is brought to the ANA domestic freight shed (in-airport freight section). These are accepted by destination (container, etc.) and flight number, inspected, sorted, and balancedly loaded. 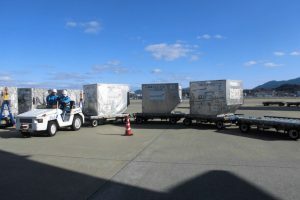 After that, they are weighed, moved to the designated equipment, and preparations are made for transportation. 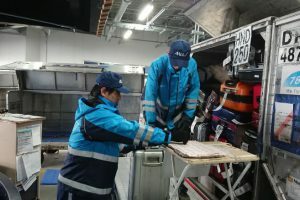 With arriving flights, to ensure that the freight containers brought into the freight shed are not given to the wrong party, the staff in charge of transportation prepares a waybill and carefully confirms the handover information. 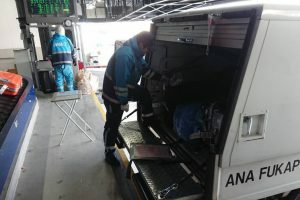 The arrival freight information is quickly shared, forklifts and other equipment used, and the arrived freight is quickly brought to all related agencies as well as small-lot customers. 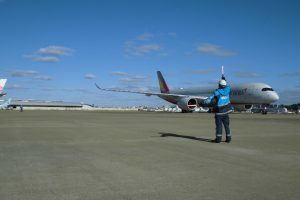 Fukuoka Airport is an extremely “fresh” airport, in that it handles a great deal of flowers, vegetables, and fresh fish (including 100kg tuna), as well as small animals such as dogs and cats. 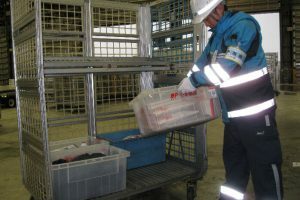 It is also a place where transfer loading of postal items and foreign cargo is done, handling approx. 280 tons of freight and postal items on a daily basis. We clean all the holds, provide water supply and drainage, and handle sewage.